Some people can never have too many pairs of shoes...for me, I can never have too many muffin recipes! And when I saw a chocolate chip-almond recipe recently, I knew I had to try it asap. 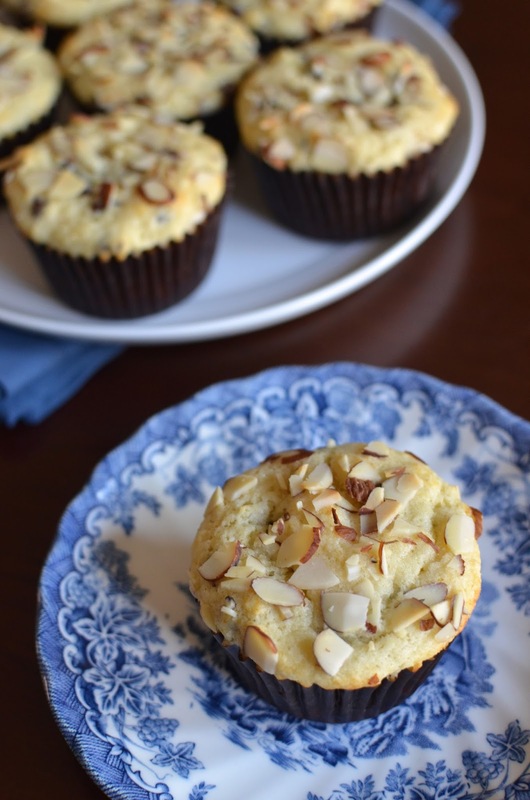 I've been on the lookout for a good almond muffin recipe - preferably one involving chocolate - for a long time. I'm thrilled I found a terrific one recently. This recipe comes from Williams-Sonoma Home Baked Comforts and what I really like about it is the addition of almond meal in the batter. That, along with buttermilk, creates a wonderfully moist, tender, and flavorful muffin! Throw some mini chocolate chips into the mix and we're really in business. Since I was a little concerned that the muffin batter itself might not be flavorful enough, I debated whether I should add a little almond extract or orange zest into the mix. I settled on orange zest and I'm really happy I did! The fresh zest contributes such a burst of flavor. It brings a freshness and brightness to the muffins. And the combination of orange with chocolate is always a great marriage because one brings out the best in the other. The orange seems to heighten the chocolate flavor even more. The recipe was meant for mini muffins but to be honest, I think regular-size muffins are mini enough as it is so I made them standard size! When I eat a good muffin like this, I often wish I could reach for another one immediately. While I certainly wanted another one after I polished off my first, one of these moist, fluffy muffins was almost surprisingly satisfying. I think it has a lot to do with the almond meal...it adds a subtle richness. So if you're like me - that is, if you like making and eating muffins, and enjoy the combination of chocolate and almonds (with orange, at that), do give these a try! I very often make small batches, or divide recipes in half, for the sake of freshness and for the excuse to bake often for my small family of three. Starting small is also a good choice for me when trying out a new recipe. So in this case, I divided the recipe in half. Making regular-size muffins like I did (rather than mini muffins), the half-recipe yields 7 muffins. You could probably pack the muffin cups a teeny bit more but I think it'll have to be the odd number. The mini chocolate chips get all melty and it just tastes like delicious, sweet, comfort food. Note: If you have this book, you'll notice that metrics weights are provided in the recipe. I have omitted it because as I was making this recipe, I noticed the conversion seemed off; the ounce to gram equivalents provided did not equate. Being as dorky as I am, I reached out to the cookbook author who was good enough to reply. She wrote and tested the recipes with cup measurements. The ounce/gram equivalents were added during the editing process and, as I said, I think there are errors. Update (Jan. 2015): I can confirm these are equally good with a splash of almond extract instead of orange zest. I add a scant 1/2 teaspoon of almond extract to the recipe below and omit the orange zest. Line standard-size muffin pans with paper liners (this recipe yields about 14). Preheat oven to 400 degrees with a rack positioned in the middle position. In a bowl, whisk together the flour, baking powder, baking soda, and salt. Whisk the chocolate chips into the dry ingredients. Place sugar into the bowl of a stand mixer fitted with the paddle attachment. Add orange zest and rub it into the sugar with your fingertips until sugar is moist and fragrant. Stir in almond meal. Scatter the butter over the top, then beat on medium-high speed until fluffy, about 1 minute. Beat in eggs, one at a time, then the vanilla, until combined. Scrape down the sides and bottom of the bowl with a rubber spatula. Add the buttermilk and beat on low speed. Add the dry mixture and stir together using a rubber spatula until just evenly combined. Scoop batter into the prepared muffin cups, filling them nearly to the top. Sprinkle the chopped almond slices on top of the muffins. Bake until muffins are lightly browned and a tester inserted into the center comes out clean, about 12-14 minutes. Let muffins cool in the pans on a wire rack for about 5 minutes, then remove them from the pans and set onto the rack. These muffins are very tasty served warm (I like to re-warm them in the microwave for about 10-15 seconds before eating). I can't have too many muffin recipes, too. This one sounds so good, and I love that you used almond meal. I'll be happy to give this recipe a try! I love the look of those melty chocolate chips and the almonds. Get the kettle going. I will be right over. Just shared! What's not to love these almond chocolate muffins?! I love the perfectly dense and moist texture. Excellent! These muffins look amazing! I totally agree, you can never have too many muffins or shoes :D I love the texture of these and the addition almond meal with the chocolate chips sounds fabulous! They look so pretty with the almond topping too! I wish I had a few for breakfast - yum! When I meet a good homemade muffin, I often wish I had one of those bakery-size jumbo muffin pans! These were satisfying but I probably could use a 'few' for breakfast! : ) Have a great weekend, Kelly. Oh, how I love my muffins. For breakfast, for snack, for dessert, for eating in bed and getting crumbs everywhere. Hey, it happens. These muffins look awesome. Eating in bed and make a mess sounds so fun, especially if someone cleans up after me! Love the way you think! You are right about that! I love to make them and eat them. Great recipe, the muffins looks delicious! Making muffins is always so easy and the results are so satisfying. I love it! Hi Marie! : ) I am so with you on the combo. Hope all is well! These look awesome Monica! I love that you added orange zest to it. Orange zest adds such a zing of flavor! Pinned! Thanks for pinning, Kristi! I feel like I can never go wrong adding zest to muffins and things. Ahh, I'm in such a muffin mood! :) .. You can bring me chocolate and almond muffins anytime! haha - would love to! Hi Monica, chocolate and orange is such a great combination of flavors, love these muffins!! Thanks, Cheri. With almond meal in the house (and I always have chocolate chips), I feel like I'll be whipping up some of these whenever the craving hits. There is no such thing as too many muffin recipes!!! These look amazing!!! Thanks so much, Amanda! Muffins are so relaxing to make and easy to eat! I'm glad you like it, too, Ashley. It's like so perfectly simple yet it all works to make a moist and tasty little sweet treat. I used to always grind my own almond meal but once I started buying it, the convenience just can't be beat. Now I love finding more recipes using it because it doesn't involve me lugging out my food processor or doing the extra step of grinding. These are darling Monica! Glad you chose the Orange zest addition and good on your for questioning the metric conversions. You can never have too many muffin recipes!! Have a good week. Thanks so much, Jo! I was scratching my head on the metric conversion. It just figures that when I finally pull out my scale, there are issues with the conversion in the recipe! You have a great week ahead, too! I love the combination of chocolate and almonds! These muffins look fabulous! Yes, chocolate takes everything up a notch in my view! : ) Thanks, Jessica. haha - thanks...I have to control myself when it comes to yummy things I love. It's hard to stop at one sometimes. Yes, I love how you think, Bianca! These muffins are so beautiful Monica!! The inside, the top...it's all so lovely! Thanks, Jessica. Glad you like them. These are like a cross between a muffin and a friand and I LOVE that. You cannot go wrong with almond meal ever. Such a great thing to have in your kitchen. All these flavours are beautiful together and like you I am never happy with a mini muffin. My mini muffin pan has been used only once:-) The tops are gorgeous too...the more almonds, the better! I hear you! I am happy to now always have a bag tucked away in my fridge. And you can totally pack the almonds down on that topping. I wish I'd loaded them up even more. I feel like I'm the same! I love collecting muffin recipes! My go-to rushing to work breakfast is always a muffin from the cafe on the way, if only I had the forward thinking to make these instead! My husband loves a sweet breakfast. I'm actually more into savory for breakfast but I love saving my muffins and things for dessert. Either way, it works! : ) And muffins do make a great on-the-go...making them at home is definitely good if you have the time. I honestly prefer to have many muffin recipes than shoes! :D I love chocolate and almond together. I wish you were my mom... I'd be so happy to go home everyday. I know something is waiting at the table. :) I love the sliced muffin shot. It's so cute! I think some of us prefer food shopping than shopping shopping! : ) Nami, your kids have it way better at your house! I would never want to grow up and leave if I were them!